I have found only two references to the Chequers Inn; one from an indenture in my collection, dated 10 July 1812, and the second in an indenture dated 13 July 1812 (clearly part of the same 'bundle' of documents) and now in the Somerset Heritage Centre, Taunton, in which land and premises, including the Chequers Inn, was leased for a year. The inn is described as "formerly a Barn Flax Shop and drying house but long since converted into a Public House called or known by the name or sign of the Chequers". The Chequers Inn was in Huish which at the time was a mere dirt track called Huish Lane leading to Hewish Field. 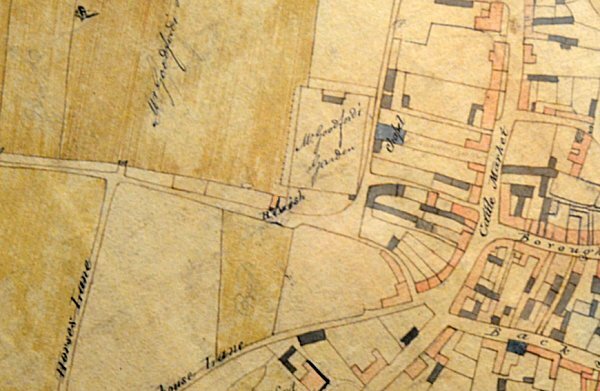 The Chequers Inn was the only building in Huish as seen by Watts' map of 1806 shown below. The owner of the Chequers Inn had been Yeovil solicitor Samuel Watts the Elder (1734-1820) but by the time of the lease ownership had passed to his three sons, described in the lease as "Joseph Watts of Yeovil in the County of Somerset Gentleman Samuel Watts the Younger of the same place Gentleman and Edward Watts of the same place Land-Surveyor". Joseph was a Yeovil solicitor as was Samuel Jnr who was also a banker, while Edward was the official Town Surveyor. The brothers were leasing the property for a year "in consideration of the sum of five shillings a piece of good and lawful British money of English currency" to their uncle (brother of their mother) "Thomas Bullock also of the same place Gentleman" and their brother in law (married to their sister Mary) "James Glyde of Yeovil Marsh within the Parish of Yeovil aforesaid Gentleman". The owner of the Chequers Inn had previously been one Henry Wills, deceased, and in fact in his will dated 8 April 1715 Henry had left "To his sister in law, Joane Wills, barn, flax shop, drying house, and the plot on which erected situate in Hewish, Yeovil, and the staddles thereon standing, the plot of ground called Nursery and 3 acres called Broome Close in Yeovil." An indenture dated 21 January 1726 in the Somerset Heritage Centre, Taunton, refers to the sale of the premises by Thomas Wills (presumably the son and heir of Joane Wills) a clothier of Yeovil, to William Gregory of Yeovil as follows - "Indenture of bargain and sale messuage or dwelling house, heretofore a barn, flax shop and drying house, and a plot of ground called the Nursery in Yeovil, formerly part of the Hewish Common Field". The word 'heretofore' presumably indicating that the premises was no longer a barn, flax shop and drying house but, perhaps, the Chequers Inn at this date? The second indenture dated 13 July 1812 notes the "said premises were heretofore in the tenure or possession of one Henry Wills deceased afterwards of one William Anstice and Joseph Anstice afterwards of George Fownes(?) and Sarah Bicknell deceased since that of John Bicknell also deceased late of William Hull but then of him the said Joseph Watts...."
In the 1812 lease in my collection the property was described as follows ".... all that Messuage Tenement or Dwellinghouse formerly a Barn Flax Shop and drying house but long since converted into a Public House called or known by the name or sign of the Chequers situate standing or being within the parish of Yeovil aforesaid in the road or way leading into Hewish Field and also the Backside & such part of the Garden as is now divided or allotted to the said Messuage or Dwellinghouse thereto adjoining & belonging all which said premises were heretofore in the tenure or possession of one Henry Wills deceased but now of him the said Joseph Watts his Tenant or Tenants And also all that plot for enclosed piece of Ground containing by estimation Eighty feet in length and forty six feet in breadth situate lying and being next adjoining to the last mentioned Messuage or Dwellinghouse called the Chequers which said Garden Plott is bounded on the East by the said last mentioned Messuage & Garden on the South by the said Road on the North by the land of John Goodford Esq and on the West by the Dissenting burying plott & was with the said last mentioned Messuage and other premises heretofore in the tenure or possession of the said Henry Wills deceased but was of him the said Joseph Watts his Tenant or Tenants And also all & singular the Yards Backsides Courts Gardens Stables Cellars Outhouses Edifices Buildings Ways Paths Passages Waters Watercourses easements profits commodities advantages privileges Heredit(ament)s Appurt(enance)s whatsoever .... "
For the full transcription click here. The Chequers Inn had been demolished by 1831 by which time the westernmost properties in Paradise Row (a terrace of some twenty small cottages with, famously, only two shared privies between them) occupied the site and are shown on Day's map of 1831. This is a section of E Watts' map of Yeovil of 1806, with Cattle Market (today's Princes Street) running down the right side with Hendford at bottom, right of centre. Running across the centre of the map to centre left is Hewish Lane, little more than a track leading to Hewish Field. At centre, below the area labelled Mr Goodford's Garden is written the word 'Hewish' which almost part-obscures a building shaded pink - the Chequers Inn - and to its immediate west was the plot of land also included in the lease and next again was the Calvinist Burial Ground - all now under Tesco's car park. 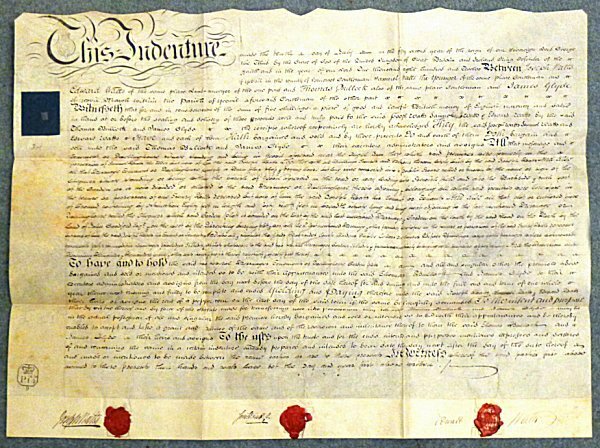 The indenture, dated 10 July 1812, in which the Chequers Inn and an adjoining piece of land were leased for a year for the sum of five shillings.